Rehearsals for Live Theatre’s 15thannual Youth Theatre Festival, Right Here, Right Now, began this week. From Thursday 7 to Sunday 10 August, young people from Live's Youth Theatre will present four evenings of entertainment based around the theme of current affairs. Right Here, Right Now showcases new work by Live Theatre's exceptionally talented home-grown Youth Theatre. Plays for Today kicks off the Birthday celebrations on Thursday 7 August at 7.30pm in Live Theatre’s Main Theatre. Live’s Youth Theatre presents a selection of exciting new short theatre pieces devised by groups of young people from across the region with support from some of the region’s leading freelance theatre makers. The pieces, devised over ten days, are inspired by recent stories, headlines and pictures from the news. For anyone interested in finding out more about journalism then join BBC Look North’s Jeff Brown as he and some of the team involved in Plays for Today talk about the process of devising plays as well as the impact of news of the youth of today at 8.45pm following the Plays for Today performances. On Friday 8 August celebrate the first anniversary of the all girls sketch group Your Aunt Fanny. Working with two of the region’s most exciting writers, Laura Lindow and Lee Mattinson, Your Aunt Fanny provides a comedy platform for some of the most talented members of Live’s Youth Theatre. The girls celebrate everything that is funny, ridiculous and inappropriate in a collection of original sketches. Join the Youth Theatre comedy coalition for a new panel show called #MouthingOffon Saturday 9 August at 7.30pm. Hosted by top North East comedian John Scott #MouthingOff takes inspiration from John’s popular panel show, presented at The Stand comedy club, Sod the Tories (And Have a Nice Week). In this politically themed game the leaders of tomorrow point out what’s wrong with the ones we have today. As John Scott explains; ‘In recent times I’ve focused my comedy a lot more on politics and social satire. I’ve been running a panel show for the past year at The Stand comedy club that takes a fairly biting look at the great and the good. Now, with the support of Live Theatre I’ve decided to develop a ‘youth’ version of the show, which will take a look at our current affairs and hopefully tackle issues affecting young adults today’. The #MouthingOff panellists will be joined by Davey Hopper who is secretary of the Durham Miners. Davey was a major figure during the miners’ strike, which celebrates its 30th Anniversary this year. Don’t miss the Festival’s final show 24/7 on Sunday 10 August at 7.30pm in Live Theatre’s Main Theatre. Seven 10 minute plays are performed after an adrenalin-fuelled 24 hours. Seven writers each choose a director, two actors and a prop to inform their work and write, rehearse and perform their piece in a day. Plus, look out for additional performances, curated by young people to showcase young talent, around Live Theatre's building, before and during the intervals of the Festival shows. Help Live Theatre celebrate the 15th annual Youth Theatre Festival from Thursday 7 to Sunday 10 August. Tickets for Right Here, Right Now events are £8, £6 concession, £3 Youth Theatre members for each performance. Tickets can be booked by contacting Live Theatre’s box office on (0191) 232 1232 or online at www.live.org.uk. Find out more about Right Here, Right Now via our Twitter https://twitter.com/LiveTheatre using the hashtag #LYTFest14. A selection of pieces inspired by recent stories, headlines and pictures from the news. Devised over ten days by groups of young people with support from some of the region's leading freelance theatre makers. Following the performances join the Plays for Today creative team and some of the Youth Theatre participants for a Post Show Chat about the process of devising shows inspired by recent news headlines. They’ll be joined by BBC Look North broadcaster Jeff Brown to discuss the broader aspects of journalism, current affairs and the impact of news on the youth of today. Phil Hoffman, from Live Theatre's Education & Participation team, will be chairing the discussion. Part of Live Theatre's Youth Theatre Festival, Right Here Right Now, in which young people from the Youth Theatre take over Live Theatre for two weeks to create three evenings of entertainment based around the theme of current affairs. Join the Plays for Today creative team and some of the Youth Theatre participants for a post show discussion about the process of devising shows inspired by recent news headlines. They’ll be joined by BBC Look North broadcaster Jeff Brown to discuss the broader aspects of journalism, current affairs and the impact of news on the youth of today. Phil Hoffman, from Live Theatre's Education & Participation team, will be chairing the discussion. Plays for Today features a selection of pieces inspired by recent stories, headlines and pictures from the news. Devised over ten days by groups of young people with support from some of the region's leading freelance theatre makers. Plays for Today is presented in Live Theatre's Main Theatre on Thursday 7 August at 7.30pm. Part of Right Here, Right Now this year's Youth Theatre Festival. 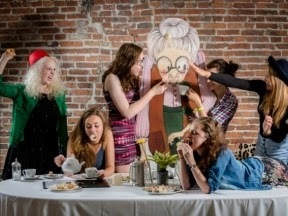 Your Aunt Fanny is a sketch group formed by some of the most talented female members of Live's Youth Theatre. From the absurd to the downright ridiculous the girls celebrate everything that is funny and inappropriate. Their hilarious collection of original and new sketches have been written especially for them by two of the region's most exciting writers Laura Lindow (Wishbone and Sawdust & Stardust) and Lee Mattinson (Never Forget, Chalet Lines and Donna Disco). Join the Youth Theatre comedy coalition for a new panel show in which they take a satirical look at our current affairs and the people that make them. A politically theme game show in which leaders of tomorrow point out what's wrong with the ones we have today. #MouthingOff will feature very special guest Davey Hopper from Durham Miners Union. Part of Live Theatre's Youth Theatre Festival Right Here Right Now. Young people from the Youth Theatre take over Live Theatre for two weeks to create three evenings of entertainment based around the theme of current affairs. This is Live Theatre's fifteenth annual Youth Theatre Festival and is produced and facilitated by Live Theatre's Education and Participation Team. Seven 10 minute plays are performed after an adrenalin fuelled 24 hours. Seven writers each choose a director, two actors and a prop to inform their work and write, rehearse and perform their piece in a day. Live Theatre is pleased to announce the writers are Paddy Campbell (Wet House), Lee Mattinson (Chalet Lines), Ian Mclaughlin (Good Timin'), Louise Taylor (10 Minutes to...), Neil Armstrong (Adam's Family Tree - YTV) as well as recent Northumbria University graduates Nina Berry (10 Minutes to...) and Francesca Wright. They will be joined by directors Paul James and Kwabena Adjei, Jackie Fielding, Tracy Gillman, Rachel Glover, Lewis Gray, Philip Hoffmann and Dave Raynor.